In June to August of 2015 I participated in the Ideation Experience exhibit at The Abecedarian Gallery. The project was based on the Ideation Deck by Barbara Tetenbaum and Julie Chen. Within the deck are Category and Adjective cards representing aspects of design and bookmaking structure. The deck acts as a catalyst in the creative process. The player of this game picks twelve cards-seven in Category and five in Adjective- and that determines the technical attitude of the book. It does not however, create the theme. In the category deck I blindly drew abstract (image), hand drawn/painted (technique), stream of consciousness/free write/rant (text), pre-treated (paper), grid (layout), highly colorful (color) and innovative (structure). Adjectives included poetic, soft, textured, whimsical and impressionistic. I wasn’t sure how to make it work. The only way I thought I could incorporate all of my cards was to draw from the subconscious (but not my subconscious, ahem) and use the fears, desires, epiphanies and general absurdities that come from dreaming. In the end, I had a box that housed five dice and unfolded into a circle when opened. I imagine there could be a lot of dialogue over whether or not a folded box is innovative, but there it is. The paper was pre-treated with a water color wash in light colors (soft, impressionistic), illustrated with dream imagery (whimsical, hand painted) and then over painted with a broken grid. I used an awl to punch holes along the grid lines. I used gold pigment and sandpaper to create pattern and texture. The dice are numbered. When rolled and put together in numerical order they form a sentence that can hopefully be interpreted as poetic and following a stream of consciousness. There are 7776 possible sentence combinations. The chances of rolling the original sentences are slim to none. I promise, the more you roll, the more ridiculous it gets. 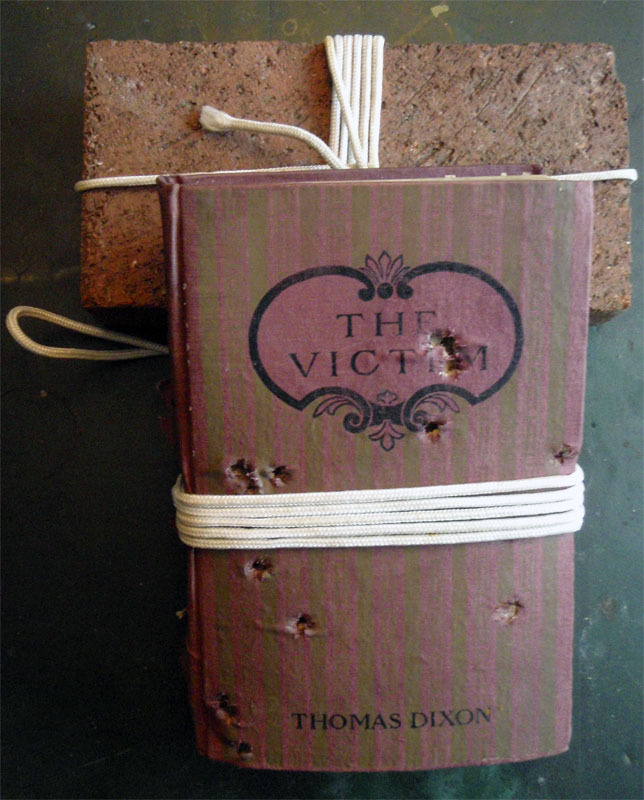 Incidentally, I made a small book with the scraps of this project. The pages are contained in a wrap around cover. There is no text, only abstraction, color and a little bit of thread. I am surprisingly pleased with the results. Perceived dream enthralls throughout existence! November’s project between Space Paste Press and Spring Leaf Press taught me a valuable lesson in my continuing exploration of the book arts. I am a book maker, not a book modifier. In what we thought would be an enjoyable change of pace, Mary and I decided to alter two books each. The books had to be under five dollars each and the alterations had to reflect the title. To prepare, I looked at a number of artists who use books as a medium including Guy Larame who fashions impressive paper landscapes and Melissa Jay Craig who creates organic, sculptural installations. Yet when I looked at my books- The Flaming Forest by James Oliver Curwood and The Victim by Thomas Dixon- I had no idea how to change them in a constructive, illustrative way, so I chose to alter them in a destructive way. 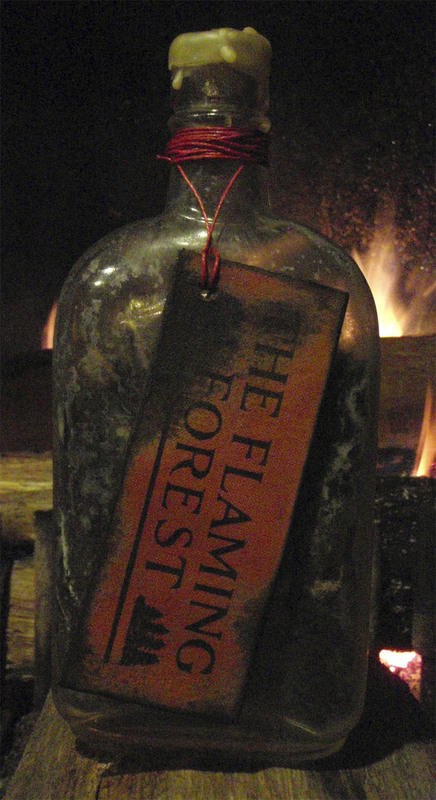 The Flaming Forest. Flaming. Fire. The answer was clear. 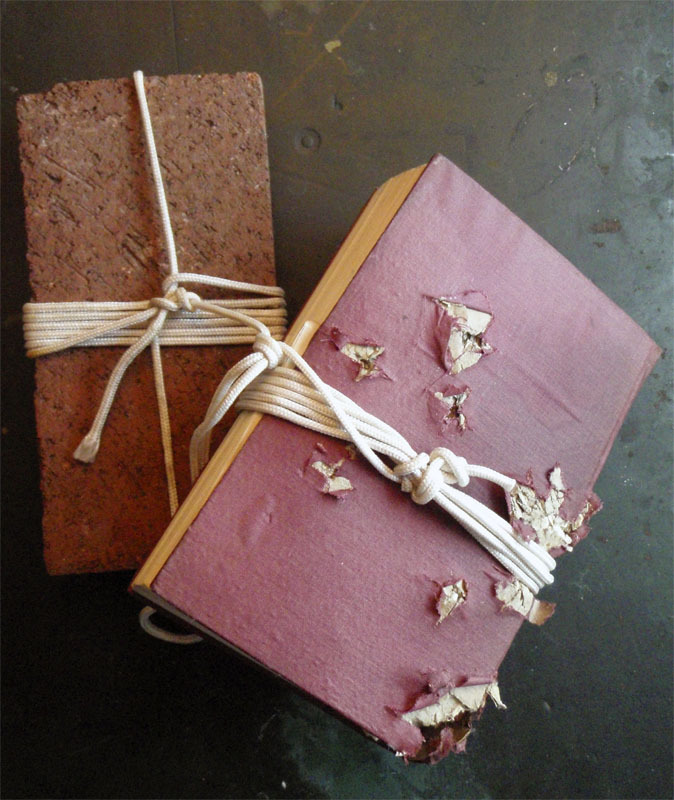 As a book artist and lover of stories, the thought of burning a book was downright deviant. In the end, I was able to justify it- the book was old, and not in an out of print, first edition kind of way but in a stained, covered with mold, allergy attack waiting to happen kind of way. Armed with my father’s propane torch and a trusty poker, I reduced it to ashes. 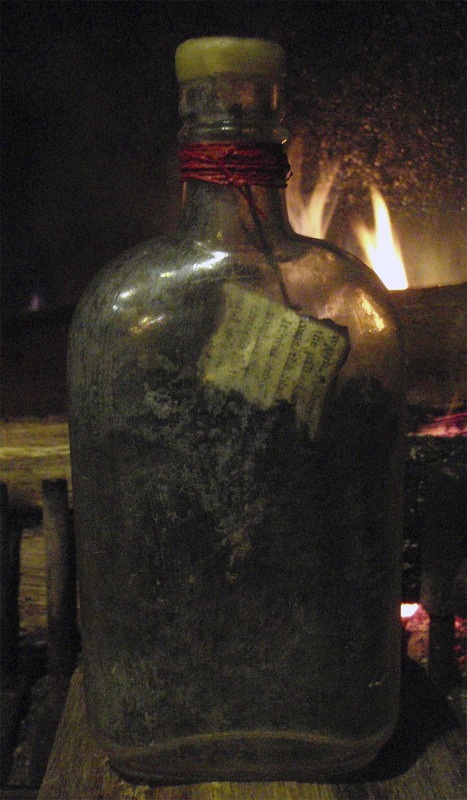 Those ashes went into an equally old glass bottle where it shares space with some carefully saved book scraps and hemlock needles. 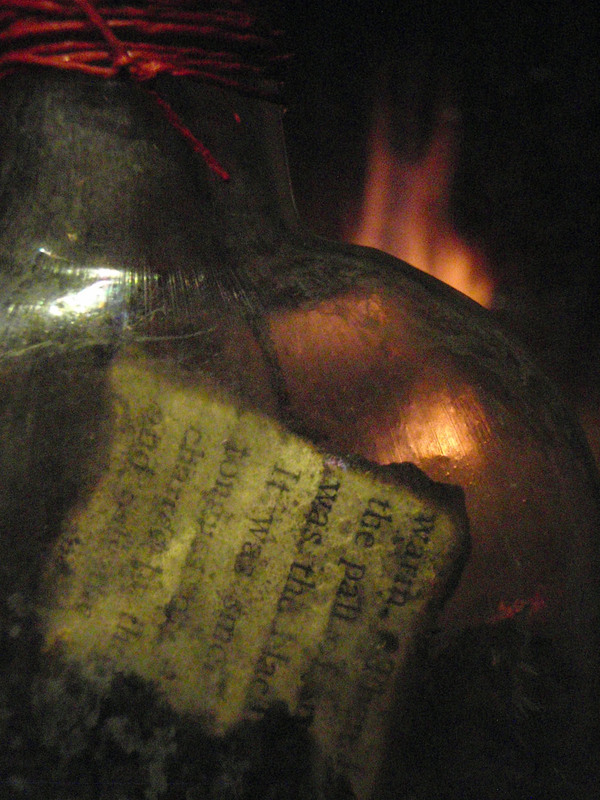 I sealed the bottle with beeswax and the contents continue to appear scorched and abandoned. The Victim. The plum and green cover reminded me of The Butler Did It tales and dinner theatre. Someone was always done in. I borrowed another of my father’s tools, a 22, and shot passionate bullets into my victim. 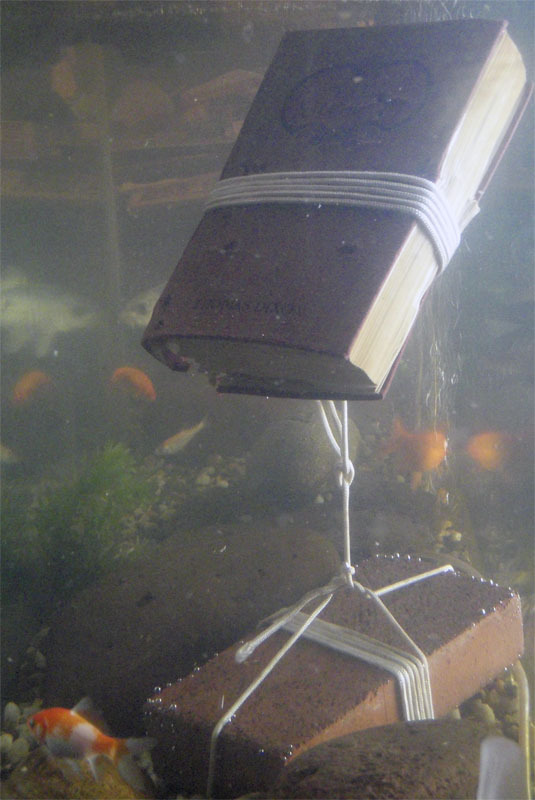 To cover up my crime, I tied the book up, attached it to a weight, and sunk it to the bottom of the lake (or more accurately, into the fish tank). Thanks to this project, I know that I do not look at books and wonder what I can turn them into. Instead I look at raw materials and wonder how I can turn them into a book.